Benedict XVI is the Pope of Christian Unity. Sandro Magister has on his site Chiesa a piece about an important "ecumenical" effort, and note those " ". He addresses a problem in the dialogue with the Society of St. Pius X or SSPX: if you try to see any of their points, efforts, or arguments in a positive light, if you even talk to them… you are accused by some of "betraying the Council"… of "trying to turn the clock back". But Benedict XVI is engaged on another ecumenical front. At the beginning of 2009, the pope’s decision to lift the excommunication of four bishops ordained illicitly by Lefebvre (in the photo) – a decision poorly communicated and poorly understood inside and outside of the Church – caused a storm of confusion and criticism. In order to clarify the meaning of his action, Benedict XVI sent a letter to the bishops on March 10 of last year. In it, he explained that the lifting of the excommunication was intended to call "those thus punished to repent and to return to unity." And he stressed that the journey of reconciliation had yet to be undertaken, because the dispute was of a doctrinal nature and concerned the acceptance of Vatican Council II and the post-conciliar magisterium of the popes. In the same letter to the bishops, Benedict XVI explained that the call to the unity of faith must apply to all Christians. And therefore it is senseless to "casually let drift farther from the Church" the 491 seminarians, 6 seminaries, 88 schools, 2 university institutes, 117 brothers, 164 sisters, and thousands of faithful who make up the Lefebvrist community. Benedict XVI himself is a target of this intolerance. [Nothing new here.] He wrote to the bishops that because of his efforts to reconcile the Lefebvrists with the Church, "some groups openly accused the pope of wanting to turn back the clock to before [Vatican Council II]." These criticisms have recently reappeared, even in theologically sophisticated forms. For example, in a cerebral commentary written by Eberhard Schockenhoff, professor of moral theology at the University of Freiburg, in the April 2010 issue of the German Jesuit magazine "Stimmen der Zeit," reproduced in its entirety, in Italian, in the latest issue of "Il Regno." Schockenhoff is a professor of moral theology at the University of Freigburg, and was a disciple and assistant of Walter Kasper, [Surprise.] now a cardinal and president of the pontifical council for Christian unity. In his commentary, Schockenhoff correctly writes that the real disagreement between the Church of Rome and the Lefebvrists does not concern the Mass in Latin, but the teaching of Vatican II, especially on ecclesiology and on freedom of conscience and religion. This key text is the final part of the memorable speech that Benedict XVI gave to the Roman curia on December 22, 2005, on the interpretation of Vatican Council II. In explaining how to interpret the Council correctly, Benedict XVI shows how it did in fact introduce new developments with respect to the past, but always in continuity with "the deepest patrimony of the Church." And as an example of this interplay between newness and continuity, the pope illustrates precisely the conciliar ideas on freedom of religion: the main point of division between the Church and the Lefebvrists. From this speech onward, it becomes clear that for Benedict XVI, the Lefebvrists can reconcile with the Church only if they accept everything written in "Dignitatis Humanae" according to the interpretation of it made by the pope, and not according to another more restrictive, or "Platonist-Augustinian," interpretation. There follow in Magister’s piece the concluding passage of Benedict XVI’s speech on December 22, 2005 and a commentary by Fr. Giancarlo Rocca, director of the "Dizionario degli istituti di perfezione," on the traditionalist groups that have been brought back to obedience so far by the pontifical commission "Ecclesia Dei," the same one that is working on the Lefebvrists. The commentary was published in "L’Osservatore Romano" on May 11, 2010. The issue of religious liberty is very difficult. The document of the Council on the topic doesn’t resolve every possible question. People of good will are free – within reasonable parameters – to have both questions and disagreements about some interpretations of Dignitatis humanae and the history of magisterial teachings on religious liberty because… I repeat… it is a very difficult topic. It seems to me that if a basic foundation of a common interpretation can be formed between the Holy See and the SSPX, then the issue of religious liberty shouldn’t have to be a deal breaker. But there are underlying theological questions concerning the nature of the Church, the starting points of theology, the problem of "modernity" and "modernism", the relation of the transcendent to the immanent. If the discussions taking place – between people of good will … and in charity we should assume they have good will – can help us to greater light about all these issues, then we all benefit. This entry was posted in Pope of Christian Unity, SESSIUNCULA and tagged Pope of Christian Unity. Bookmark the permalink. It’s with the followers of Archbishop Marcel Lefebvre, who are still in a state of schism with the Church of Rome…. (interview on Italian Channel 5. Nov 13, 2005). (interview published in “Die Tagespost”, Feb 8, 2007). “[Y]ou may fulfill your Sunday obligation by attending a Mass celebrated by a priest of the Society of St. Pius X” (letter, January 18th, 2003). Correct me if I’m wrong, but in 1988 had Archbishop Lefebvre set up a hierarchy of his own, it would have been a schismatic act,….he did not. And, sad to say, in a Jesuit magazine. Sigh. Rome – Schockenhoff writes – wants to extract a verbal acknowledgment of the freedom of conscience and religion, the cornerstones of modern culture, from no less than the Lefebvrists, the most dogged enemies of modernity. But doing this is like trying to “square the circle,” impossible. Bishop Fellay used the same expression, “squaring the circle”, about the same subject in an interview a few months ago. So, perhaps for different reasons, both have coincided in the same rather negative judgement about success. Yes and no: Liturgy is still a contentious subject – even if Benedict and many in his circle have created unprecedented space and sympathy for liturgical Tradition at the top of the Church, or even that the broader tide is finally turning, there is obviously a long way to go down the road before we can say the liturgical gulf between the Society and much of the Church has closed up, or even reached shouting distance of each other. And yet, Schockenhoff is right that getting agreement on liturgy will still be easier than on Dignitatis Humanae. A document whose interpretation is still vexed. It states that it “leaves untouched traditional Catholic doctrine on the moral duty of men and societies toward the true religion and toward the one Church of Christ.” Yet how is this to be reconciled with the bold yet ambiguous affirmations the rest of the document makes? If it is increasingly clear that John Courtney Murray’s model was not adopted, it is still not entirely clear what *was* adopted. SSPX may rightly demand some clarification on this, even as we realize that we’re not likely to find an interpretation that many in the Society will ascribe to. Any agreement, I think, is going to have to leave a good deal of constructive ambiguity – whether it is really a “Augustinian-Platonist” one or not – one which will likely alienate some Catholic liberals but also some of the harder line SSPX contingents. But then, I must say, it has always seemed unlikely to me that all of the Society would ever come over in any rapprochement – at least in my lifetime, if not well beyond. As Fr. Z rightly notes, this is a subject which is “very difficult,” and it is one which the Church has struggled with from the beginning. By the way, the Giancarlo Rocca piece is well worth reading – an interesting summary of how Tradition has rebounded since 1988. Click the link and read it. As a member of a chapel administered by the Society of Saint Pius X and therefore a supporter of the Society, I read everything I can get my hands on with regard to not only what the Society is trying to do, but the progress of the talks that are under way now in Rome. Many people may not understand the fact that these are not “negotiations” but “discussions”, and as such will probably not yield what some people would hope for. There will be no meeting halfway, Sandro Magister has nothing to worry about, liberalism and modernism are here to stay for a long time. There are legitimate concerns about the SSPX, and legitimate concerns from the SSPX. And then, there are “thinkers” like this Schockenhoff, who make the rest of us long for faster reconciliation just to make them unhappy. (Of course, schadenfreude is an unworthy motivation, but boy, would it be entertaining.) As always, it’s amusing to see the biggest proponents of wide open theological thinking suddenly become rigorists, and the very folks who love dissidents and grassroots movements hating those which hold opinions they don’t sympathize with. It is odd enough that people like Mr Schockenhoff are easier with our separated Christian brothers, true heretics and schismatics, than with the Lefebvrists whom we hope they will unite back to the Church nextly, nor even with the many traditionalists who are currently INSIDE the Chuch. Anyone interested in “Dignitatis Humane” and how it fits within the larger Catholic Tradition should consult Fr. Brian Harrison’s superb book “Religious Liberty and Contraception.” I also recommend any of Fr. Harrison’s other articles, which can be found via a Google search. Religious liberty has been a difficult issue because it is sometimes hard to tell what the Church has taught definitively about religious liberty in terms of unchanging doctrine and what the Church has suggested or commanded as changeable public policies about how religious liberty should be exercised in different countries and situations throughout history. For example, it would be difficult to see how any civil government today could legitimately restrict all public manifestations of non-Catholic religions as a threat to the common good, which was once the practice in some countries. Christians have come to understand that it is probably better if civil governments are not too heavy-handed in matters of restricting religious error because most big government action and intervention is not a good thing, even when the government is acting in favor of the truth. Christians also seem to realize that the Prostestant religions today actually help to build up the common good insofar as the Protestant religions act to counter the rampant secularism of our societies. There certainly was a time when Prostestant religions were rightly viewed as more detrimental to the common good—when Catholic states were truly unified in their Catholic Faith as the center of correlation for the life of society; however, even the so-called Catholic countries today are rarely truly unified in the Catholic Faith. Most Catholics living in Catholic countries barely even attend Mass regularly. My point is that what is necessary to maintain the common good of a civil society with regards to religious liberty can change over time, even though the doctrinal principles of religious liberty never change. On his blog, in italian, Magister doesn’t speak about the “their rejection of the authenticity of Vatican Council II” but about “il loro rifiuto dell’integralità del Concilio Vaticano II”, that is their rejection of the entirety/intergrality of Vatican Council II. Interesting take on the concept of Religious liberty. Would you say, as you seem to imply, that the State’s responsibility to uphold the “common good” is limited to the temporal sphere? I do not disagree that if the state restricted all public manifestations of non-Catholic religions it would likely adversely affect the common good – but only if one measures the “common good” from a purely temporal perspective. AMEN pewpew! My thoughts were exactly the same. Yes punish the conservative folks but let the liberal do what ever they want “In the spirit of Vatican II”!!! This work provides very good context for the reading of DH in light of tradition. Father, my hobby-horse, I am afraid. This week you have referred to Maynooth and their poo poing Transubstantiation, there have been senior clerics speaking in the same vein, as also a self-professed Jesuit genius. better if civil governments are not too heavy-handed in matters of restricting religious error because most big government action and intervention is not a good thing, even when the government is acting in favor of the truth. You just made the point for the SSPX. Civil governments can TOLERATE non-catholics, but they CAN NOT openly advocate error. This is what so many people don’t get or don’t agree with. The STATE should be an extension of the Catholic church. The states laws should always harmonize with the Catholic faith and never contradict or advocate error. This is the reason why many traditionalists favor a monarchy over a democracy. A Monach, similar to the Pope, should be a God fearing leader who watches over his people and governs them in harmony with the Catholic church. It is much more likely that a Monach will be able to avoid popular opinions, that may be errors, from becoming law. Freedom of religion does mean you can be any religion, only that the Catholic church will TOLERATE the religion as long as it does not espouse error. All people are still called and required to be members of the Catholic church as established by Jesus Christ. When we stray from these clear teachings then we get things like endless wars, abortion, killing the infirmed, etc. enshrined as “Rights” in the civil government. Some of the documents of VII especially confuse Catholics into thinking that the traditional teachings, such as the one I outline above, have changed. The SSPX wants Rome to conclusively state as much. To the liberals this would be a death blow. It would put an end to “inter-religous” dialogue that did not have conversion as it’s primary purpose. It would end the “Free to follow your conscience and ignore those teachings you conscience does not like”. One day +ArchBishop Marcel Lafevbre will be a Saint. My humble opinion. I would like to recommend an incredible little book to everyone, particularly anyone who might think there might be any heresy what-so-ever within the ranks of the Society, a book that explains a lot of what the Society is about by Archbishop Lefebvre, entitled; “Open Letter to Confused Catholics”, in which he presents a major study of the crisis within the Church. With regard to the above article by Sandro Magister, that little ditty is only one tiny snowflake in the blizzard of negative mis-information constantly being circulated about the Society. The only way to get even CLOSE to the truth about what’s going on is to hear both sides of the story, the “Open Letter to Confused Catholics” is a hundred and sixty pages of explainations from the Archbishop, and another excellent book from the Fathers of Holy Cross Seminary titled: ” Most Asked Questions about the Society of Saint Pius X”,…at a little over a hundred pages. There is no need for those who seek the truth, even religious truth, to fear honest & rational thought. The Catholic Church is the one religious organization of which you can ask any question. You might not get an answer right away, but you will get an answer. It’s one of the most important reasons why I’m Catholic instead of something else. The analogy of faith is robust for Catholics and its foundation is the truth. This is a prominent feature of Catholicism. One cannot study philosophy even in a secular university, for instance, without discussing St. Thomas Aquinas or St. Anselm–great Catholic heroes of the search for truth. Many disciplines are like this: even mathematics, genetics, etc. I could not be Mormon or some other religion where dogma is so frail that you can’t query it for understanding without ostracism and failure. Their dogma is cult-like and it just doesn’t hold up. Correct. But other Catholic groups have, and in violent opposition to the Holy See. This is what I find ridiculous about calling the SSPX schismatic. They’re not the big offenders, and I’m not only talking about fashion and preference here; I’m talking about specific discrete statements and acts, and lots of them. Msgr Brunero Gherardini, “the Ecumenical Vatica Council II, A Much Needed Discussion. At times, the civil goverment best helps man achieve his eternal end by simply allowing man to seek God and follow God according to his own conscience without state intervention. At other times in history, civil governments have needed to step in and take a more active role in assisting man in his spiritual life through the direct repression of non-Catholic religions. It is true that civil governments cannot openly advocate error because error has no rights. Protestant religions, however, are not totally in error. Protestant religions follow Christ, esteem the Word of God, believe in charitable outreach, and even have a valid Catholic sacrament of baptism in some cases. The Church has chosen to now focus on those aspects of Protestant religions and other religions that are true. Often, those truths can serve civil society as a good bulwark against things even worse—atheism and secularism. A civil government can support the parts of Prostestantism that are truthful and good without advocating the errors of Protestantism. Aquinas embraced the truths of Aristotle even though Aristotle was a pagan philosopher in error about certain things. I agree that a state’s laws should harmonize with the Catholic Faith, even though that is not always possible. For example, the government of a pluralistic country like the United States could not explicitly and entirely favor the Catholic Religion without causing some sort of constitutional crisis or dangerous civil unrest in the country. It would be unwise and immoral for a government to stir up such civil strife in a state for the reason of promoting the True Religion. In any event, it is the primary or distinctive task of the Church to promote the True Religion, not the civil government. While governments have no right to promote error, governments cannot go to any length to promote the truth either. For example, it is also good that citizens carry out physical exercise often, but government officials cannot hold a gun to the head of a citizen and demand that he exercise every day. Number one of DH left “untouched the traditional teaching of men and societies towards the one Church of Christ and the True Religion.” Moreover, at the Council, Bishop de Smedt explained that section one of DH was meant to specifically recall Leo XIII’s teaching about the duty of the public authority itself, and not just society in general, towards the True Religion. Sadly, it is not always possible for a government to carry out its duties towards the True Religion. We do not live in a perfect world. Also, religious liberty is not a right to error. No one has a right to hold erroneous beliefs. DH taught that the right to religious liberty must not be understood as a right to error but as the right of people to ordinarily be free from coercion (or tolerated) in matters of religion because religious matters are something between the individual person and God. The Church is simply for the freedom of individual conscience from civil coercion not for the religious errors that people might wrongly embrace through the misuse of their conscience. As Pope Pius XII also pointed out regarding the government’s repression of religious error, “The wheat and the weeds will grow together until the end of time.” Some things the Lord will take care of in His own time. Individual humans and human governments are not called by God to right every wrong and repress every falsehood. Some Traditional Catholics may favor monarchy over democracy, but that is not the viewpoint of the Church. Pope Leo XIII taught in “Immortale Dei” #4, “The right to rule is not necessarily, however, bound up with any special mode of government.” An elected President can rule in a way that is holy and consistent with the Catholic Faith. For example, the elected leaders of the modern Republic of Malta have carried out public executive and legislative acts that favor the True Religion. Both Monarchs and elected Presidents can rule justly and according to the Catholic Faith. Sadly, both monarchs and elected Presidents can also rule poorly. Sorry Jason, I just do not see how the state can “help man achieve his eternal end by simply allowing man to seek God and follow God according to his own conscience without state intervention”. Even in this day and age, people look to the government to identify acceptable behaviors and standards so will likely develop an erroneous conscience. Note that I am not necessarily talking about the repression of false religions (although “repression” can take many forms), but about the promotion of the true Catholic religion. I am not arguing that all civil goverments should be neutral in matters of religious truth, but sometimes it is just as well if the civil government does little with regards to religion. I say that because civil governments often get things wrong. Civil governments have a hard enough time managing the affairs of the temporal order without having to worry about the affairs of the eternal order, too. In any event, the Church has been designated as the special society tasked with promoting the True Religion. The civil government has not been tasked with the same role as the Church. Would you want civil leaders like Obama, Chavez, Castro, Ahmadinejad, and Kim Jong-il using state power to tell people how to achieve eternal salavation? No, thanks. In states run by these people, it would truly be better for the civil government to let man be and not intervene in matters of religion. On the other hand, in an ideal Catholic state with good Catholic leaders, the civil government could and should take a more proactive approach in cooperating with the Catholic Church for the benefit of man’s temporal and eternal happiness. Vatican II’s “Gaudium et Spes” #76 encourages this close cooperation between state and church where possible. Even in a Catholic state, though, we wouldn’t want a marriage so close between state and church where the two become the same entity. It seems only problems result from a situation like that. History provides us with many unfortunate instances where the state’s intervention became so strong in matters of religion that individuals no longer had a personal right to choose and follow God according to their own conscience. Matters of faith can only be carried out in an atmosphere of freedom. Individuals should not feel psychological or physical pressure from the government to choose a certain religion. After all, ontologically the civil government and state exist to serve the individual and not vice versa. The dignity of the human person must always be kept at the forefront of our discussions about how big of a role the civil goverment should play in matters of religion. The question should always be: What type of government intervention in matters of religion best serves the human person? In some cases of the modern state, it is clear that no government intervention is the best idea. It is true that the state has some role to play in the forming of consciences through the writing of laws, good example, promotion of virtues, etc., but I think we have gone too far if we expect the state to be the primary former of consciences in society. Again, that is the role of the Church, of families, etc. Also, as I said earlier, the state often gets it wrong anyways. For good reasons, it seems that Christians have moved away from the idea of a paternalistic state where the civil government acts as a father figure making all of the decisions on behalf of the passive children or subjects of the state. That type of arrangement can easily turn into a tyranny. I also agree that no government has a right to promote religious errors or put other religions on an equal footing with the Catholic Religion; however, not every civil government is in a position to promote the True Church. For example, if our civil government in the United States openly promoted the Catholic Faith as the True Religion it would cause something like a civil war. Do you think a civil war would be in the interest of the common good, temporal or eternal? The civil government basically starts a civil war over the promotion of the True Religion, a task that has been given primarily to the Church anyways? Again, the civil government cannot build up the True Religion at any cost or through means that would involve the state ignoring its primary task as the caretaker of the TEMPORAL common good. The state could not legitimately build up the Church if it meant the state had to cause extreme temporal civil strife and unrest to do this promotion of the True Religion. I really do not disagree with what you say – at least the practical and pragmatic parts. I also agree that, given current circumstances, it would be detremental to impose a Catholic state here in the US. Where I disagree is your seeming suggestion that this is how it should be and should remain. Using the State’s coercive power to bring psychological or physical pressure on the individual would be wrong (at least given current circumstances). Equally wrong though is the State using its coercive power to prevent the Catholic Church from bringing psychological or physical pressure. This latter part seems to be what you are promoding as the ideal rather than as the best we can hope for until more favorable conditions arise. “1 . 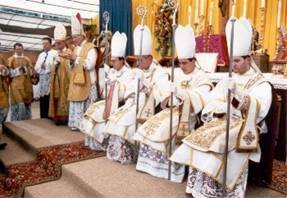 From the Motu Proprio “Ecclesia dei” of 2nd July 1988 and from the Decree “Dominus Marcellus Lefebvre” of the Congregation for Bishops, of 1st July 1988, it appears above all that the schism of Monsignor Lefebvre was declared in immediate reaction to the episcopal ordinations conferred on 30th June 1988 without pontifical mandate (cf CIC, Can. 1382). All the same it also appears clear from the aforementioned documents that such a most grave act of disobedience formed the consummation of a progressive global situation of a schismatic character. 2. In effect no. 4. of the Motu Proprio explains the nature of the “doctrinal root of this schismatic act,” and no. 5. c) warns that a “formal adherence to the schism” (by which one must understand “the movement of Archbishop Lefebvre”) would bring with it the excommunication established by the universal law of the Church (CIC, can. 1364 para.1). Also the decree of the Congregation for Bishops makes explicit reference to the “schismatic nature” of the aforesaid episcopal ordinations and mentions the most grave penalty of excommunication which adherence “to the schism of Monsignor Lefebvre” would bring with it. Until some other statement with the force of law, they remain schismatic. Patrick, presumably Cardinal Hoyos has access to the same documents you cite and yet has reached the opposite conclusion. Who do you think I should believe? Granted, his personal opinion carries less weight than an “official interpretation” but certainly it carries more weight than yours or mine. Just to make sure what I am saying is clear, you have read the ” official interpretation issued by the Pontifical Council for the Interpretation of Legislative Texts” and Cardinal Hoyos has read the ” official interpretation issued by the Pontifical Council for the Interpretation of Legislative Texts” and have both come to polar opposiste conclusions. The interpretation says what it says. It’s not ambiguous in any way. It’s the Church’s lawful teaching regardless of what a Cardinal, who is in charge of diplomacy on the subject, decides to say in a media interview. Just like we know what the Church officially teaches on no salvation outside the Church, no matter what Cardinal Kaspar says in an interview. Patrick, you are missing the point. You are asking me to accept what an anonymous blogger says on a message board as opposed to what a Cardinal says in a public interview.. I would be inclined to agree with you if the documents you cite were a bit more explicit. I find it interesting that they never actually come out and explicitly state that the society is, in fact, schismatic. But lets get away from whose interpretation of the interpretation is correct and take a look at the bottom line. If the society is schismatic, as you state, then it follows that all of its members have excommunicated themselves. I think we can both agree that Motu Proprio “Ecclesia Dei” stated as much. And yet, the Holy Father has lifted the excommunication. As this was not a formally declared excommunication ( as it was for the Orthodox), the Holy Father could have taken this action for one of three reasons. Either the original interpretation of Motu Proprio “Ecclesia Dei” given by the PCILT was in error, the popular understanding of the PCILT interpretation was mistaken or the condiditions that caused the initial Latae sententiae excommunication were no longer present. Unless you are willing to suggest that the Holy Father is willing to risk the eternal damnation of all of the members of the society for the sake of “diplomacy” or “politics”, I do not see how you can believe that the society remains in a state of schism.